As we try to soak up the last few hours of summer before a new school year begins there is so much to do. I am checking and rechecking their back packs to make sure they have all of their school supplies. Making sure their lunch boxes and folders are labeled. Doing a final fitting of their school uniforms to make sure the shirts and bottoms are comfortable. It’s hard to say bye to summer. Summer was filled with family activities, being outside, going to fun camps, hanging out with friends. We also had landmark moments this summer. Moments that we talked about as the summer started. Moments that we hoped to accomplish before the new school year starts. Moments such as my youngest learning how to ride to a two-wheeler. Moments like my like oldest taking on the role of junior counselor at a youth camp for the first time. Moments like spending time together as a family to make memories that would fill our hearts with so much love and happiness that they almost burst. We spent much of the summer working to earn things. Earning time to play on the xbox. Earning time to watch another episode of Doc McStuffins past bedtime. As this epic summer draws to a close and the focus turns to having an even more epic school year, the kids and I talked today about experiencing great moments and about earning things. The discussion then turned to setting goals. When I taught in an elementary classroom years ago, and even now when I do trainings with adult educators, we always discussed setting goals first. The first day of school, I would talk with my students about creating goals or things they want to accomplish this year. When I conduct trainings with educators, we always set goals for what we want to accomplish during our time together. In each of those times, the goals were always created and agreed upon together. After some thought-provoking (and quite hilarious) discussion and after realizing the kids had never really done this before, I wanted to work with them in establishing their own personal goals for the new school year. We talked about why goals are important and how they had actually set goals for themselves AND accomplished them this summer without realizing it. We decided to break up our goals into long-term and short-term goals. A long-term goal is one they want to accomplish by the end of the school year. The short-term goal is one that they want to accomplish in the first month of the school year. The kids wrote them down and then posted them up in their rooms so they can continue to see it. What I especially love is that both kids didn’t completely focus on academic goals for themselves. They strived to create goals that make them better all-around people. Earn the end of the year Spelling award for my grade. Get to know the new kids in my grade. Take and pass 6 AR (accelerated reader) tests. 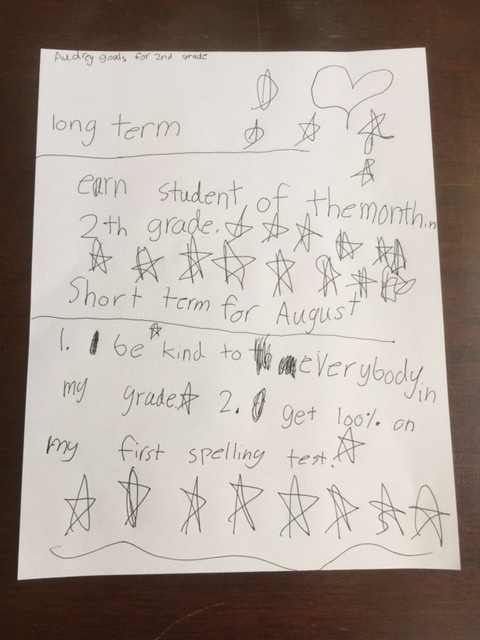 Earn “Student of Month” in second grade. 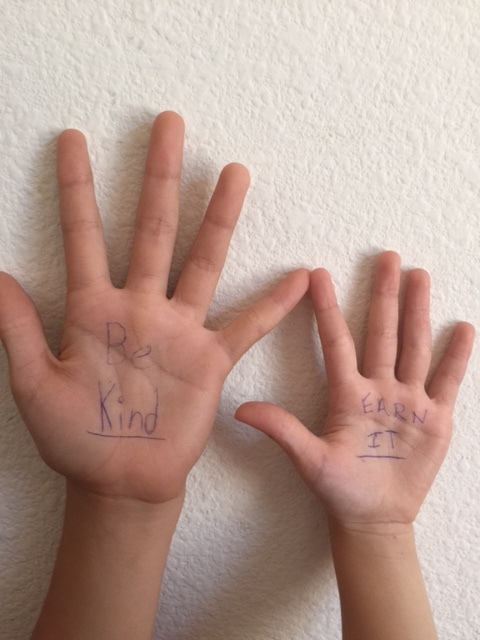 Practice kindness to everyone in my grade. Get 100% on my first spelling test. 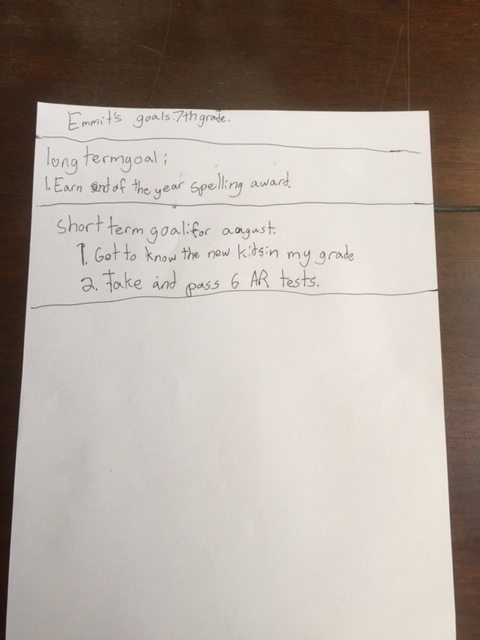 When first setting goals, my youngest would keep saying, “For my long term goal, I just want to work hard.” Getting them in the mindset of creating SMART goals makes them think about their goals more and put more time into wanting to accomplish them. If they state a goal and it’s really general, keep asking them those SMART questions: Work hard at what? Is there a subject where you want to work hard? Which subject? Why? How do you know that you’ve accomplished working hard at that subject? Taking the time talk through what goals to set and then writing them down, gives kids more of an investment in the goal. The more invested they are, the more likely they will accomplish it. Short-terms goals take some time to accomplish. Long-term goals taking even longer to accomplish. Posting written goals up where kids can see them regularly is a simple way to keep them motivated and to keep them from forgetting them. You can also encourage having your kids read them every day as part of a regularly routine. Either before they leave for school or before they go to bed. When anyone sets a goal themselves; whether short-term or long-term; they develop a sense of purpose. While encouraging goal setting for your kids, don’t forget to set some goals for yourself! 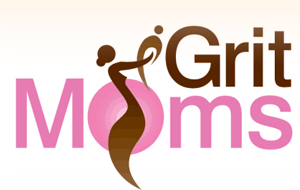 This entry was posted in Blog, Projects and tagged goal setting, grit, growth mindset, new school year on August 16, 2015 by gritmoms.